It's a slow time of year for motorcycle news, but that doesn't stop us from indulging in some wild speculation. We stumbled across a piece from a Japanese website predicting a modern revival of the classic Kawasaki H1 Mach III, as well as retro-styled versions of the Z650 and Z400. Another piece from the same site proposed a new Honda CB750 or CB900. I could find no concrete evidence to back up these theories, but there are some reasons why Kawasaki might choose to pursue either of these retro models. Let's start with the H1 Mach III, which was also known as the Widowmaker thanks to its high (for the time) horsepower, poor steering, and drum brakes. This year marks the 50th anniversary of the model's introduction in 1969. Despite having been somewhat overshadowed by the even more powerful Honda CB750's introduction that same year, it's still the prime time to launch a revival of this model, particularly among other retro bikes like the new Suzuki Katana. 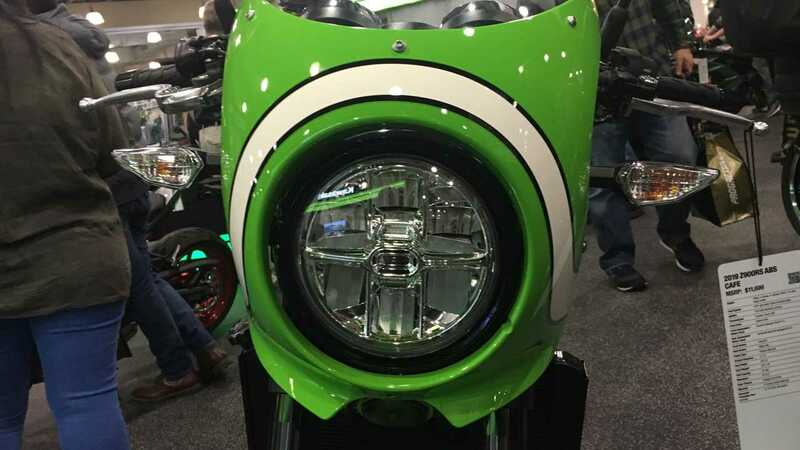 What would a new Mach-style Kawi look like? Possibly a naked and/or retro version of the Ninja H2. Its supercharged drivetrain is certainly worthy of the Mach III's legacy. It would probably be slower than the Ninja H2, due to being less aerodynamic and possibly a more upright riding position, but that's okay. Perhaps call it the "Kawasaki H2 Mach V," since "Mach IV" name was used on later versions of the original bike. Give it similar styling as the original, and there you go. As for retro style versions of the Z650 and Z400, we don't need to look much further than the existing Z900RS and Z900RS Cafe for inspiration. Both of them look great. When I sat on the Z900RS at New York IMS it reminded me of the Universal Japanese Motorcycles of the early 1980s that I learned to ride on. These bikes appeal to nostalgic riders like me, as well as younger riders hopping on the hip retro bandwagon. Kawasaki already has some solid smaller displacement bikes in the Z650 and Z400. It would take little more than a new skin to create Z650RS and Z400RS models appealing to riders who don't want a big 900. It would also be an easy way for Kawi to create a naked bike out of the smaller Zs, which may appeal to riders who don't want something as sporty, or newer riders who don't want to worry about breaking bodywork if they drop it. Honda already follows a similar formula with the CB1100 EX, CB650R, and CB300R. Each of these is a retro-styled version of Honda's large, midsize, and small platforms, respectively. It would make sense for Kawasaki to follow this same formula, and perhaps gain an advantage with a Z400RS. Given the existence of these three models, however, I'm not sure there would be room for a CB900 or CB750 in the lineup. Honda doesn't currently offer any engines in these displacements, meaning they would need to be new models rather than modifications of existing ones. A 750 would be too close to a 650 to be worth producing, and a 900 would be too close to Honda's 1000 and 1100cc engines. Despite the speculation, I doubt we'll see a second coming of the CB750 for its own 50th anniversary. Once again, this is all just wild speculation, with absolutely no basis in fact (except for this year being the 50th anniversary of the H1 Mach III). Not that Kawasaki will listen to an old man shouting at a cloud on the internet, nor should they, but I'd love to see any of these hypothetical models become a reality.